Our editorial staff is always looking for collaborations to improve communication and promotion of our movement. If you believe that unity is strength ... and you would like to contribute to the evolution and diffusion of women's football, this is your chance! In these first 18 years (celebrated in 2014) we have tried to offer a constantly updated source of information and above all reliable, generating a huge article archive: 13.770 at 31 January 2014. We have developed ad hoc programs for companies and athletes, prepared spaces for regional and youth sectors; spaces for every initiative, aimed at information and promotional and professional events. 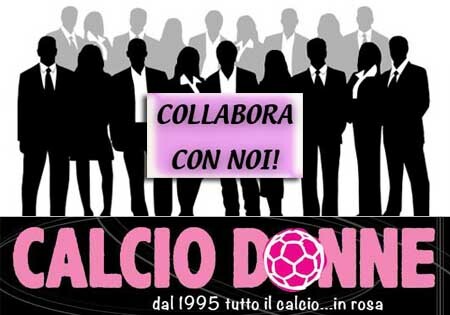 This site has always supported voluntary non-profit work, is based only on the passion of those who love women's football and, through our portal, wants to be known for their passion and expertise. In the details the services we would like to expand. In the comments you can suggest the columns that are missing. - management of new columns on football and women who play sports, gossip, fashion. We want to expand the services on FOREIGN FOOTBALL: to present the teams of foreign championships with their game modules and information on the embedding and to do interviews in the original language. To do this we need people who also know languages. - interviews, so as to make known who the Italian athletes are. to be updated in the tutor's program with the results of the match with the tables. We have the sure sources that provide us with data, people are missing for management and insertion. - BOMBER CLASSIFICATION UPDATE: we want to make all the women's football rooted without distinction.